I’m so pleased to host Kristy Perkins on the blog today to talk about her short story in the anthology Fractured Ever After. Old classics are fractured into exciting new tales in this international collection of magic, mystery, and adventure. Some heroes go searching for their happily ever after: a dragon cocoon hunter explores the dangerous woods for his sleeping beauty; a prince forces a perfect romance on an unsuspecting maiden; and when a girl leaves town, she must quickly decide to trust—or be wary of—a new stranger. Destiny is thrust upon others: a disconnected emperor struggles to retain his title; a frog prince leaves his pond in search of answers; and after Rapunzel is rescued, a new quest is awarded to her savior. Whether it is destiny or choice, all actions have consequences: sibling rivalry pushes one little piggy to extremes and a princess must choose to follow her heart or step up as future queen. Prepare for an adventure as these eight fantastic fairy tales transport you to places beyond your imagination. Jebraun: Hi Kristy! Thanks for joining me. I love that we’ve both got short stories in upcoming anthologies. The blurb sounds great! I’m wondering, what was the inspiration behind your story? Kristy: I wrote a short story as a Christmas present detailing the holiday misadventures of an older Rapunzel’s family. I’m not sure how much I want to spoil about my story’s ending, so I’ll just say that there were elements of that story that made me curious how things could have ended up that way after the usual events of that fairy tale. So that was my starting point. Beyond that, I knew that Rapunzel had a secret, so the prince had to be the POV character, and the rest of the story unfolded from there. Jebraun: Oooh! Rapunzel is a favourite of mine! Did you have any difficulty coming up with a story to fit the theme of the anthology? Kristy: Oh, no! I love fairy tales, and my real problem was choosing which story idea to go with. Another forerunner was a variation on The Little Mermaid, the version where she ends up as heartbroken seafoam. Jebraun: Oh, dear! Break my heart! That ending truly makes me sad! What were some of your biggest challenges during the writing/editing process? Kristy: The prince! Almost everyone who read early and middle drafts noted that he didn’t quite work as the POV character because Rapunzel just felt more like the main character. It was a struggle to bring him forward and make him more active in how he was dealing with Rapunzel and their relationship. Hopefully I succeeded! Jebraun: I can’t wait to read it and find out! What was your favourite story in the anthology (besides yours, lol) and why. Kristy: “On the Wrong Foot”! It’s the funniest retelling of Cinderella I think I’ve ever read. I tend to gravitate toward the more humorous stories. Also, “Beauty” gets an honorable mention because dragons are my favorite. Jebraun: I love Cinderella retellings, too! How do you sustain yourself whilst writing? Kristy: Sugar. Pure, raw sugar that I consume by the spoonful. Oof. Forget the joke, that just makes me feel a little nauseous. I like things like goldfish crackers, chocolate chips, pieces of chicken. Not all together! The main idea is something where I can nibble it a tiny bit at a time. Reward myself after every sentence if the writing is going slowly. Favorite drink is tea, either pu-erh or a spice tea, depending on my mood. I tend to get involved in writing and forget I made myself a cup so it oversteeps, but that’s how I like it so it works. Jebraun: Yeah, I was definitely making a face at the idea of spoonfuls of sugar! And I tend to end up with oversteeped tea myself 😉 So, if you could be a fairy tale creature, what would it be? Kristy: DRAGON!!!! Absolutely I would choose to be a dragon. I could fly, breathe fire, have beautiful shining scales, a massive hoard of treasure, and if I was lucky, I could find the right cave and be as antisocial as I wanted because no one would bother me because DRAGON. I could even still be a writer, with voice-to-text programs. I’m Jebraun: Dragons are awesome! Thanks so much for answering all my questions and best of luck with the release of your anthology! Kristy Perkins is a nanny, and a writer whenever she can find the time. Ever since she could write legibly, she has created stories. She writes fantasy and sci-fi stories to satisfy the need for more dragons and spaceships in her life. “Out of the Tower” started as a simple tale of a boy falling in love with a girl after he rescued her from a witch. But that was too easy, so he had to lose all his memories and then try to avoid the problem. When that also proved too simple, the wonderful Rapunzel gained a secret of her own, which led to the story found here. Short stories of Kristy’s can be found in other JL Anthologies. Check out Kristy’s blog or follow her on Twitter or Pinterest. We’ve got a fabulous giveaway going to celebrate the release of both Fractured Ever After and Encircled! Third Prize (International): Two Ebooks (Fractured Ever After and Encircled), choice of 3D-printed bookmark (pick one design) OR set of four signed illustration prints. Enter the giveaway through this magic portal! Too short to be an elf and too tall to be a Hobbit, Jebraun lives smack-dab in the centre of New Zealand’s North Island surrounded by thermal activity, stunning lakes, and enough Redwoods to make her Californian heart swoon. She writes about discovering identity, living without fear, and enjoys creating fantastic worlds. Her loves include coffee, tree ferns, dark chocolate, and Jesus, and she harbours a secret penchant for British spelling. 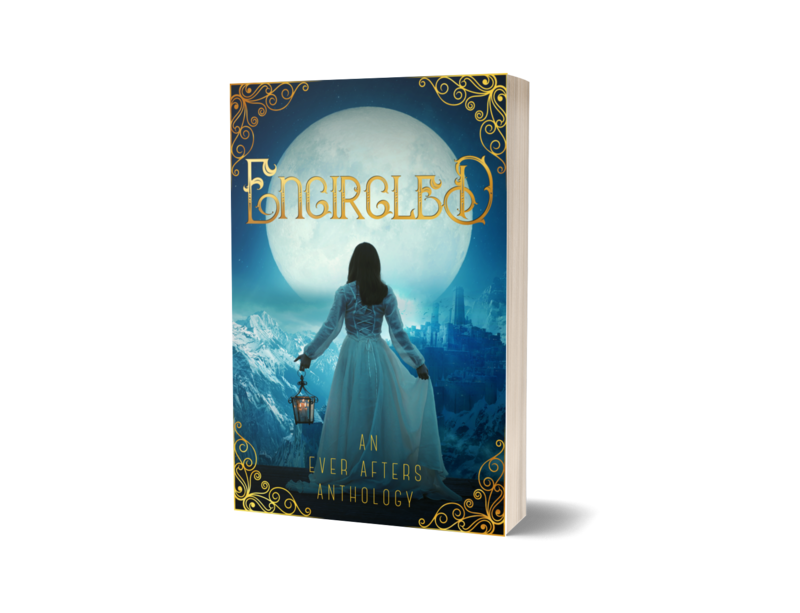 You can find her sci-fi short story “Beyond the Stars, Past the Moons” in Encircled, a collection of fairy tale retellings. Have you signed up for my newsletter yet? You’ll get instant access to my flash fiction story, “The Stone Veil,” plus I give away New Zealand chocolate and an e-book in every newsletter!